The one-member commission, formed by the Supreme Court to probe into the Arsalan Iftikhar graft case, has summoned real estate tycoon Malik Riaz on September 27 to record his statement, it has been learnt. Sources in police told Pakistan Today that Aabpara Police on Wednesday delivered the summons to Malik Riaz at his residence. The Supreme Court on August 30 had formed the commission comprising Dr Shoaib Suddle to probe into Arsalan’s alleged dealings with Malik Riaz. The sources said it was Malik Riaz himself who received the summons. According to the sources, the commission had earlier issued summons for Malik Riaz last week but they could not reach him as some police officers were reluctant to deliver it. On this, the commission issued fresh summons directing police to deliver them, the sources said, adding that a sub-inspector visited Malik Riaz on Wednesday and delivered the summons. The commission has directed Malik Riaz to appear before it on September 27-28 to get his statement recorded. 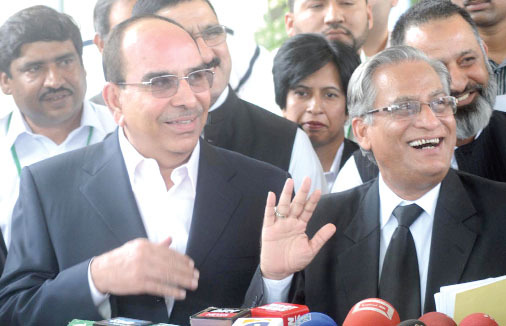 Malik Riaz has already challenged the Supreme Court’s verdict of forming Dr Shoaib Suddle commission. sub inspector …a Joke ?? Mlik Riaz has already submitted a petition against this illegal commission so he is not liable to respond to summon by this commission, SC should restrict commission to summon or to ask to appear before this till decision regarding Malik riaz"s petition.